Neumann, to a physicist seeking help with a difficult problem: Simple. This can be solved by using the method of characteristics. Physicist: I'm afraid I don’t understand the method of characteristics. 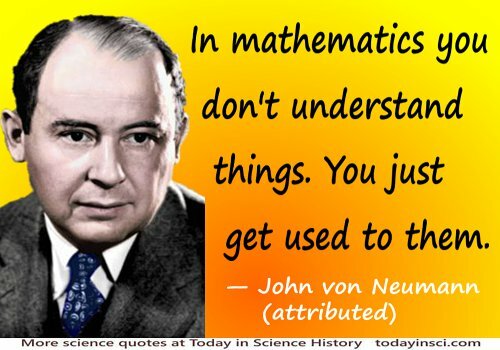 Neumann: In mathematics you don't understand things. You just get used to them. Attributed, as related by Dr. Felix Smith (Head of Molecular Physics, Stanford Research Institute) to author Gary Zukav, who quoted it in The Dancing Wu Li Masters: An Overview of the New Physics (1979, 2001), 208, footnote. The physicist (a friend of Dr. Smith) worked at Los Alamos after WW II. It should be noted that although the author uses quotation marks around the spoken remarks, that they represent the author's memory of Dr. Smith's recollection, who heard it from the physicist. Therefore the fourth-hand wording is very likely not verbatim. Webmaster finds Zukav's book seems to be the only source for this quote.